Enjoy a mimosa on any day including Sundays. Grab-N-Go Soups, Salads and Sandwiches are always at the ready. Pick from fresh produce. Take home from our bakery case. Cold Bottled Beer and wines by the glass or bottle available with your meal. PRIVATE PARTIES & SHOWERS are hosted in the Cafe from 3-5pm, Mon to Sat by reservation. Tucked away under the oak trees in Clearwater is this delightful neighborhood cafe serving breakfast, lunch a Sunday brunch in a casual, yet upscale atmosphere to the surrounding Pinellas County communities of Belleair, Largo, Dunedin and St. Petersburg. We are conveniently located along the Pinellas Trail. 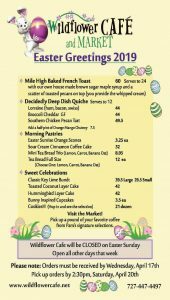 Wildflower Cafe and Market will be CLOSED on Easter Sunday. Open all other days that week. Please note: Easter orders must be received by Wednesday, April 17th. Pick up Orders by 2:30pm, Saturday, April 20th. 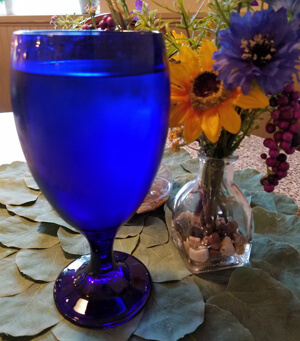 Wildflower Cafe is offering Florida spring water at a very affordable price for your enjoyment. Proceeds from the sale of spring water will help build wells in impoverished countries. We serve the full breakfast menu Weekdays 8am-11am and Saturday 8am-Noon. Select breakfast favorites are available all day on the regular menu. Sunday Brunch is served 8:30am-2pm. Stop by for a nice selection of grab-n-go sandwiches, salads, quiche, sweeties and cold beverages. Join the Wildflower Birthday Club and receive a special present for your next birthday.